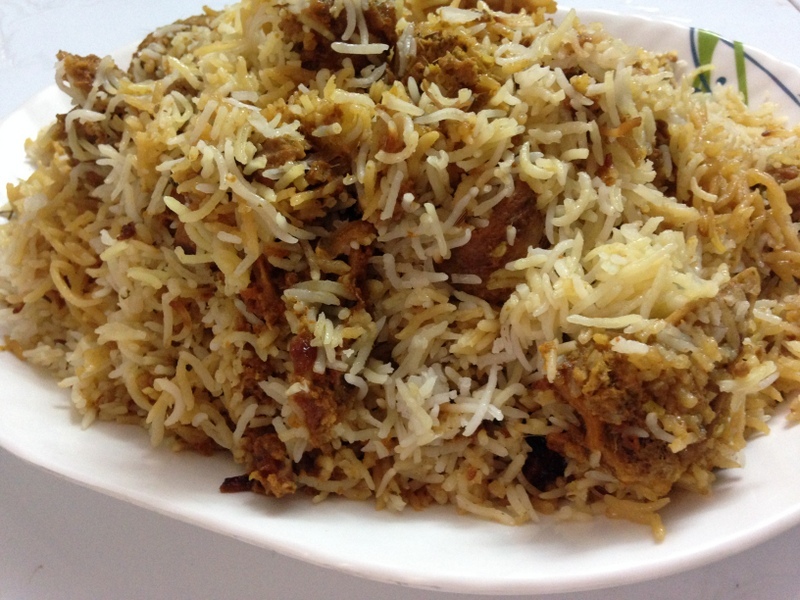 A Hyderabadi biryani is different from other biryanis in India. It is called “raw”, as the meat is marinated overnight, then cooked with the rice from raw. It is delicate, fragrant, subtle but flavourful. The tastiest biryani I have ever tried was at the home of one of my friends, a Hyderabadi of regal bearing, with an interest in food that matched my own. The table was weighed down with the best Mughlai Hyderabadi dishes: proper kormas, a whole kid goat surrounded by rice, haleem, stuffed roasted chicken, knuckle soup, kebabs, their own square naans and of course the biryani, which was so big it had to be carried by two men. This is a lamb biryani or one can call it as Gosht biryani in Urdu. Heat 5cm (2in) of oil in a saucepan and deep-fry the onions slowly until just brown and crisp. Remove with a slotted spoon and place on kitchen paper. Reserve the oil. Wash the lamb well and prick it all over with the point of a knife. Place it in a bowl and add the papaya paste, salt, black pepper, chilli, garam masala, black cumin, lemon juice, ginger and garlic pastes, yogurt, 3 tbsp of the onion oil and two-thirds of the onions, crushed in your hands (if the onions are still soft in places, don’t worry about it). Now add the cardamom pods, cloves and cinnamon and half the coriander and mint taken from the amount for the biryani. Mix with your hands to help combine the flavours. At this stage you can leave it to marinate, covered, overnight in the fridge, or for a few hours, depending on how much time you have. When you are ready to cook, place the meat in a heavy-based pan and allow to return to room temperature. Make a firm dough with the flour and around 150ml (⅔ cup) water: you should be able to stretch it, but it should be firm. Roll into a sausage as long as the circumference of the mouth of the pan. Wash the rice really well in several changes of water and soak for 18–20 minutes. Meanwhile, place a large pot of water (the water should be 15cm/6in deep) to boil with the remaining whole spices, herbs and 2 tsp of the lemon juice. Season well, it should taste salty. Heat the saffron in a dry pan until crisp and add the milk, bring to a simmer and cook for 1–2 minutes. Take off the heat. Add the soaked rice to the spiced and seasoned water. Return it to the boil and then start timing. The rice needs to come off in 2½–3 minutes. Meanwhile, place a sieve over a bowl in the sink. When done, drain the rice through the sieve into the bowl. Spoon the rice over the meat in the pan. Place over a medium-high heat and, after about 7 minutes, you might be able to hear the steam build up in the pan. Reduce the heat to its lowest, using a heat diffuser if you have one, and cook for 50 minutes. Turn off the heat and allow to sit for 10 minutes. Pull off the dough and serve, slightly mixed through.